Almonds are believed to be one of the most ancient fruit to be cultivated. There are several mentions of almonds along with dates in the Old Testament of the Bible. The other nut mentioned in the Bible is the pistachio. Did you know that almond is not a nut? It's a stone fruit, that is related to cherries, plums and peaches. But in case with almonds only stone is eaten, not the pulp. 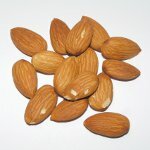 One of the finest almond varieties is Jordan almond, that looks like a large plump. This almond is frequently sold in a colored sugar glaze. There is a nice legend about almonds, that comes from the Greek mythology. The myth tells about beautiful princess Phyllis, who was left waiting at the altar in the day of her marriage by Demophon, her intended. Phyllis was waiting for him, but finally died of a broken heart. Gods sympathized Phyllis and transformed her into an almond tree, that has become the symbol of hope. Almonds are an excellent source of vitamin E and magnesium, they have the highest level of protein and fiber among all tree nuts. The protein in almonds is more like a protein of human breast milk, that is why almonds are the best base for baby formulas.